A world class chef in Justin Cogley produces creative and innovative dishes in a tiny, 42-seat restaurant in deluxe Hotel l'Augerge Carmel on a quiet street in Carmel-by-the-Sea. In 2013, Food & Wine magazine named him Best New Chef, and a year later Forbes Travel Guide bestowed on Aubergine its highest five-star rating. 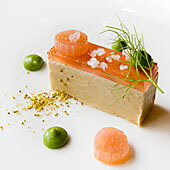 And this month the prestigious French magazine Le Chef named Cogley one of 100 best chefs on the planet. Justin Cogley, a young and talented new chef, brings a bevy of unique inspirations to the menu, departing from the more French/California approach of the previous chef and exploring new directions in tastes and taste combinations. 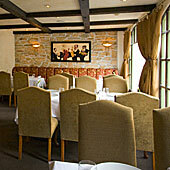 So if you enjoy the fun and excitement of exploring new culinary waters, this is the restaurant for you. 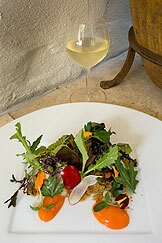 Chef Cogley focuses on the sea and backs it all up with a fine market basket from local growers. Chef Cogley says his culinary focus is on spontaneity. This is certainly true but he is also a trail blazer in finding combinations of ingredients and getting them to sing in harmony in altogether new ways. His food is fun and novel. He has a "tasting menu" that is the American version of the "Menu Degustation" or many small dishes that cover a wide range of his library of dishes, none of which are fixed but vary based on what the freshest ingredients are on the day of dining. Each is paired with a wine chosen to marry nicely with each dish. 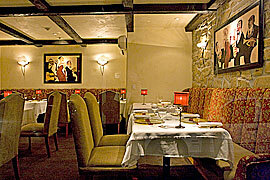 Aubergine is the intimate 42-seat restaurant of the deluxe l'Auberge Carmel, run by owner David Fink and his wife Kathleen Fink. It's ambiance is an extension of the hotel with a warm, European country feel with a smooth entwining of antiques, stone walls and the paintings of Clifford Bailey in the restaurant and the public rooms. The same calm, professionalism suffuses the staff who manage to be both efficiently professional with no display of effort while at the same time as friendly and relaxed as you would like them to be. Unobtrusive to a fault and anticipate every need. 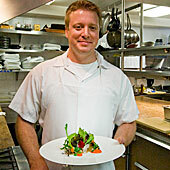 And Chef Justin Cogley and his small kitchen staff, keep the courses coming at a perfectly measured pace. He is ably supported in the dessert department by Ron Mendoza, executive pastry chef, formerly of "Sona and Boule" in Los Angeles and "The French Laundry" in Yountville, Napa Valley. The kitchen is just on the other side of the dining room wall, so plates arrive within seconds of preparation and Chef Justin Cogley is often to be seen peering around the door checking on his guests. Aubergine boasts an underground wine cellar that was constructed beneath the inn's courtyard to house the restaurant's 4,500 bottle collection. The wine list features great wines from around the world but especially wines from Monterey County, California and France. But this is no ordinary wine cellar. It's racks are within temperature and humidity controlled cases with glass doors and the room itself doubles as both a tasting room and dining room for small parties with the racks of wine bottle serving to set the tone. Cogley comes to Carmel from Chicago, Illinois. For more than four years he worked at critically acclaimed Charlie Trotter's Restaurant, the last two of which he was chef de cuisine, responsible for the entire culinary staff, menu creation, special events and instructing the culinary team in all duties. Most recently he was the executive sous chef at the Elysian Hotel in Chicago, where he was instrumental in opening the new hotel’s kitchens.